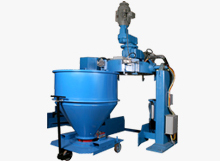 Reliance’s (RC) Container Mixer is a medium intensity mixer primarily used in industries where dispersion of material and pigments are essential but where an aggressive mix is not necessary. These units are frequently used in the Powder Coating & Color Concentrate Industries. For more information on our sizes and specs please view our (RC) Container Mixer Specs Page. 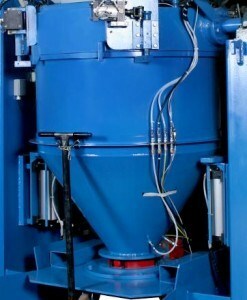 Container Mixer Hoppers: Reliance’s Container Mixer Hoppers are specifically designed to aid the mixing process. The conical shape allows the simple forces of gravity and deflection to throw the material back into the rest of the mix. Multiple containers allow for easy change over and less down time. The containers can be jacketed for the circulation of a heating or cooling median. If necessary they can be furnished with a fixed baffle assembly inside the container. The Hopper can be supplied with injection ports where needed. Container Mixer Tools: Reliance’s Container Mixer tools are provided with two standard tools. 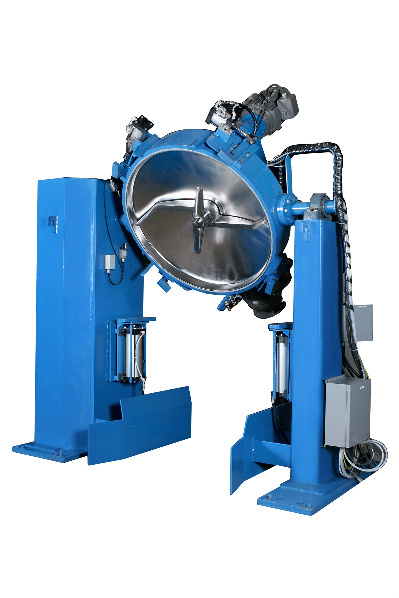 The large tool stretches from one end of the mixing head to the other, its primary function is to lift material. The smaller tool is called the chopper tool and is used to fluidize the material. The tools are driven by Variable Frequency Drives to allow for speed control. Based on the application, Reliance can supply specialty tools and choppers for toner, concentrate color, powder coating and niche applications. 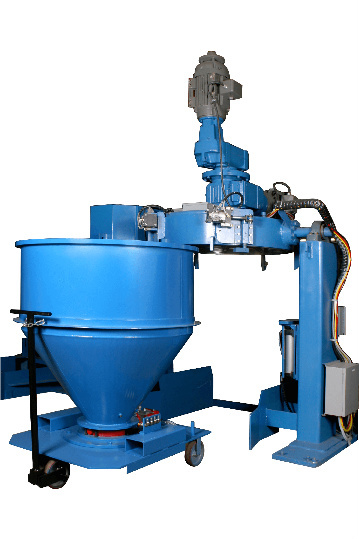 Container Mixer Mixer Heads: The Mixing Head of Reliance’s Container Mixer is designed to provide an air tight seal with the Mixer Container. 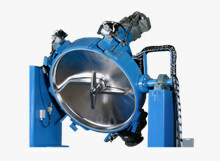 The mixing head is supplied with air purge shaft seals and a venting port. 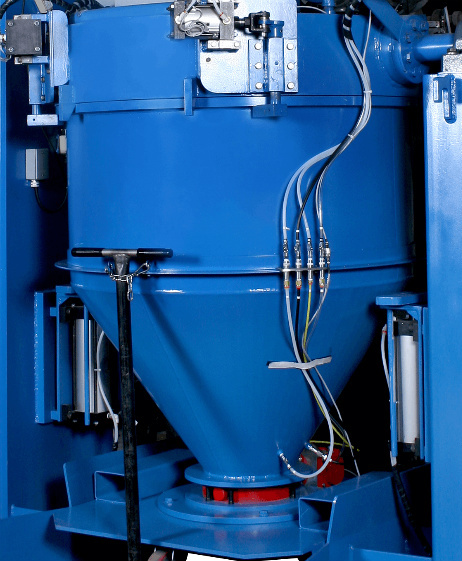 Chopper Assemblies can be supplied through the Mixing Head for additional shear. Container Mixer Injection Nozzles: Nozzles can be added near the discharge for the injection of liquids or gas during the mixing process. They can be used for inerting the mixer as in the case of metallic bonding or chemical reaction rich processes. Gases and Liquids can be added to the mixer while the mixer is in the mixing position.